A couple of interesting, politically edgy films with Thailand ties to watch out for in the program of In Search of Asia: Minneapolis-St. Paul Asian Film Festival – The Legend of Chao Fa and Breaking the Silence: Burma's Resistance. 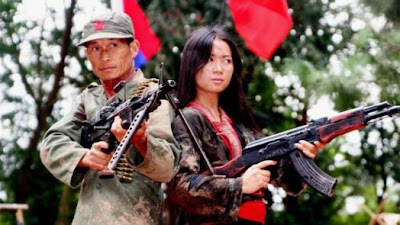 The Legend of Chao Fa (Vaj Tuan Thawj) is an action saga set during Laos' "Secret War" about freedom fighter Vaj Tuam Thawj and his struggle to save his father and country from the communists. Fittingly for the Twin Cities – a stronghold of Hmong people – it's the world premiere for the movie, directed by Jimmy Vanglee and "shot in the jungles of Thailand by the world’s leading Hmong film team." Catch the trailer, embedded below. The fest also has the daring documentary Breaking the Silence: Burma's Resistance, in which filmmakers Pierre Mignault and Hélène Magny secretly crossed from Thailand into Karen State, where war has been waged for 60 years between the Karen rebels and the Myanmar junta. There's a trailer for that too, and it's a bleak picture of country that is having its first elections in 20 years this weekend. The Twin Cities fest, running until November 13, also has the Vietnamese actioner Bẫy Rồng (Clash) and a healty dose of Hong Kong martial arts, like Ip Man, Ip Man 2 and Gallants.